Thierry Meyssan invites us to observe Donald Trump without judging him by the same criteria as his predecessors, but by trying to understand his own logic. He notes that the President of the United States is trying to restore peace and relaunch world commerce, but on new foundations, completely different from the current system of globalization. Donald Trump inaugurates the « Strategy and Policy Forum » at the White House (3 February 2017). Seeking to overthrow the Power that preceded him, which is still trying hang on despite him, President Trump can not compose his administration by relying on the political class or on senior civil servants. He has therefore solicited new collaborators, entrepreneurs like himself, despite the risk that this confusion of rôle categories may entail. According to the Puritan ideology, which has been in fashion since the dissolution of the Soviet Union, mixing state policy with one’s own private affairs is a crime – one of the reasons for which a strict separation has been installed between these two worlds. On the contrary, though, during the last few centuries, politics was not regarded from a moral standpoint, but from that of efficiency. It was therefore considered normal to associate entrepreneurs with politics. Their own personal enrichment was not considered to be «corruption» unless they grew fat on the proceeds of the Nation, but not when they developed it on their own. Concerning his relations with the Great Powers, President Trump approaches Russia on the political level, and China on the commercial level. He is relying on Rex Tillerson (ex-head of Exxon-Mobil), a personal friend of Vladimir Putin, as his Secretary of State – and on Stephen Schwarzman (the boss of the capital-investment company Blackstone), a personal friend of President Xi Jinping, as President of a new consultative organisation tasked with proposing the new commercial policy – the Strategy and Policy Forum, inaugurated by President Trump on 3 February at the White House . The meeting brought together 19 top-level entrepreneurs. Contrary to previous practises, his advisors were not chosen according to whether or not they had supported the President during his electoral campaign, nor in terms of the size and influence of the businesses they managed, but rather in terms of their personal capacity as managers. As CEO of ExxonMobil, Rex Tillerson has created a new form of partnership with his Russian opposite numbers. First Gazprom, then Rosneft, authorised the United States to come and work with them on the condition that the US would allow them to co-operate with them elsewhere. So the Russians have now invested one third of the funds for ExxonMobil’s projects in the Gulf of Mexico, while the multinational has assisted with the discovery of a gigantic field of hydrocarbons in the sea of Kara . This was the shared success that earned Rex Tillerson the Medal of Friendship from the hands of President Vladimir Putin. The Press underlined the personal links that he has developed with the Russian President and with Igor Sechin, Putin’s right-hand man. As the head of ExxonMobil, he confronted the Rockefeller family, the founders of the company. In the end, he managed to impose his point of view, and the Rockefellers have since begun to sell their shares with a view to quitting the company . According to the Rockefellers, oil and gas are depletable resources which will soon be running out (Peak Oil, a theory which was vulgarised in the 1970’s by the Club of Rome). Their use expels carbon particles into the atmosphere and thus provokes global warming (a theory vulgarised in the 2000’s by the «Intergovernmental Panel on Climate Change» and Al Gore) . It is time to move on to renewable sources of energy. On the contrary, according to Rex Tillerson, nothing we know so far can truly validate the idea that oil is a sort of compost made of scraps of biological matter. We are continually discovering new deposits in areas bereft of source rock, and at ever-increasing depths. Nothing proves that hydrocarbons will run out in the centuries to come. And nothing proves that carbon particles expelled into the air by human activity is really the cause for climatic evolution. For this debate, each of the two camps has financed an intense lobbying campaign in an attempt to convince political deciders, in the absence of a determining argument . These two camps are of course defending diametrically opposite positions in terms of foreign policy. This why the fight between the Rockefellers and Tillerson certainly had an impact on international politics. Thus, in 2005, the Rockefellers advised Qatar – whose wealth is derived from ExxonMobil – to support the Muslim Brotherhood, and then, in 2011, to invest in the war against Syria. The Emirate sank tens of billions of dollars to support the jihadist groups. But on the contrary, Tillerson considered that although clandestine war may be good for imperial politics, it is not good for business. Since the defeat of the Rockefellers, Qatar has progressively been withdrawing from the war, and is now dedicating its spending to the preparation of the World Football Cup. In any case, for the moment, the Trump administration has made no decision in terms of Russia, other than abrogating the sanctions levied in reaction to alleged Russian interference in the Presidential election campaign, allegedly spotted by the CIA. President Trump first of all shocked the People’s Republic of China by accepting a telephone call from the President of Taïwan, despite the «One China, two systems» principle. Then he apologised to Xi and warmly wished him a «Happy New Year of the Fire Rooster». Simultaneously, he offered him a sumptuous gift by cancelling the Trans-Pacific Partnership. This agreement had not yet been signed, but had been conceived, just like all globalist decisions over the last fifteen years, in order to exclude China from the decision-making process. President Trump has opened a channel for negotiation with the main commercial and financial authorities of China, via the members of his Strategy and Policy Forum. 9,3% of Stephen Schwarzman’s company, Blackstone, has been owned since 2007 by the sovereign funds of the People’s Republic, China Investment Corp. ,whose Director at that time, Lou Jiwei, is today the Chinese Minister for Finance. Schwarzman is a member of the Advisory Board for the School of Economics and Management at the university of Tsinghua . This Council, placed under the presidency of ex-Prime Minister Zhu Rongji, brings together the most important Chinese and Western personlities. 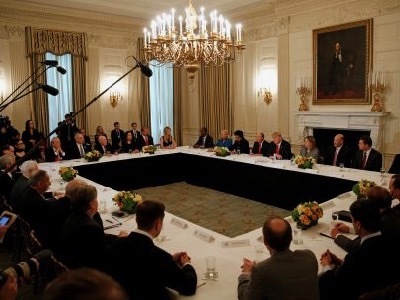 Among these are Mary Barra from General Motors, Jamie Dimon from JPMorgan Chase, Doug McMillon from Wal-Mart Stores, Elon Musk from Tesla Motors and Indra K. Nooyi from PepsiCo – they also have chairs at the White House’s new Strategy and Policy Forum. In a previous article, I pointed out that since his meeting with Jack Ma from Alibaba (also a member of the Advisory Board at the university of Tsinghua ), Donald Trump has been considering the possibility of joining the Asian Infrastructure Investment Bank (AIIB). If this were to happen, the United States would cease hampering China, and begin true cooperation to build the «Silk Roads», thus rendering the conflicts in Ukraine and Syria pointless . Since the breakdown of the USSR, US policies have been set by the «Wolfowitz Doctrine». To make sure their country would remain the «leader», successive administrations have never hesitated to deliberately launch all sorts of wars which have brought them to the brink of poverty . Of course, this poverty did not affect everyone. We therefore witnessed an intra-capitalist struggle between the companies which profit from war (currently BAE, Caterpillar, KKR, LafargeHolcim, Lockeed Martin, Raytheon, etc. ), and those which profit from peace. The Trump administration intends to reboot the development of the country by breaking with the ideal of being the «leader», and instead, becoming the «best». This will have to happen quickly. It will take years to open the Silk Roads, even though their construction is already under way. Consequently, the United States do not have the time to renegotiate the current major multilateral commercial Treaties. They will have to conclude bilateral agreements without delay, so that the contracts can be implemented immediately. Knowing how difficult it is to reconvert a war economy into a peace-time economy, Donald Trump has associated with his Strategy and Policy Forum an entrepreneur from one of the companies which could develop as well in peace-time as it could in war-time – Jim McNerney (Boeing). ““Rosneft” will have access to resources in the Gulf of Mexico”, by Juliana Gortinskaya, Translation Deimantas Steponavicius, Оdnako (Russia), Voltaire Network, 10 January 2017. “1997-2010: Financial Ecology”, by Thierry Meyssan, Translation Roger Lagassé, Оdnako (Russia) , Voltaire Network, 7 December 2015.